For years, the North Central West Virginia Airport was a thriving place of aviation activity, particularly when it was the Benedum Airport. All of that changed, however, after the 9/11 attacks. Suddenly, and for various reasons, an airport that would see more than 20,000 passengers flying out of its facility was struggling. In fact, in 2007 a year of declines saw the airport have less than 5,000 customers leave Bridgeport via air service. At that time, things seemed bleak at best. Fast forward a little more than 10 years and things have changed. In fact, things are going so well right now that NCWV Airport Director Rick Rock was able to announce some really good news last week. During the August meeting of the Benedum Airport Authority, the airport’s governing body, Rock talked about the 2007 year. He also talked about July of 2018. “In 2007, we had 4,813 passengers the entire years. In July, we had 4,617 passengers,” said Rock. 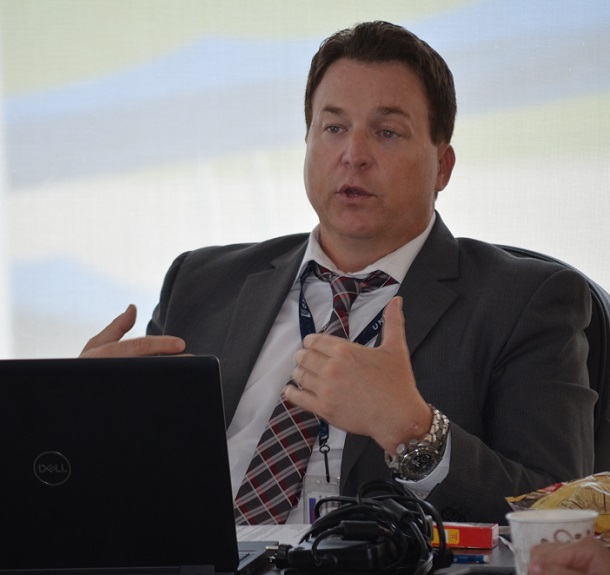 “I think we’ve experienced explosive growth in the last few years, especially watching Allegiant grow and mature with their destination flights to Orlando and then Myrtle Beach. Rock’s statement about the community trusting United isn’t incorrect. And he knew the trust would need to be built after some disastrous daily service prior to their arrival. The last daily air service provider, Via Air, started strong only to whiter badly. Delays that usually led to cancelations or simply cancelation of flights was the rule as opposed to the exception. Now, cancelations on the daily flight service to either Chicago or Washington, D.C. is a rare exception as opposed to the norm. The numbers, again, back that up. In March of this year United had 970 passengers followed by 1,164 in April and 1383 in May. In June, it reached 1,586 before hitting 1,731 passengers in July. The August numbers weren’t in as of last week’s meeting, but officials said they are strong once again. Rock said the airport has marketed the flights with success. The best method, he said, has been something else. The turnaround has been huge. 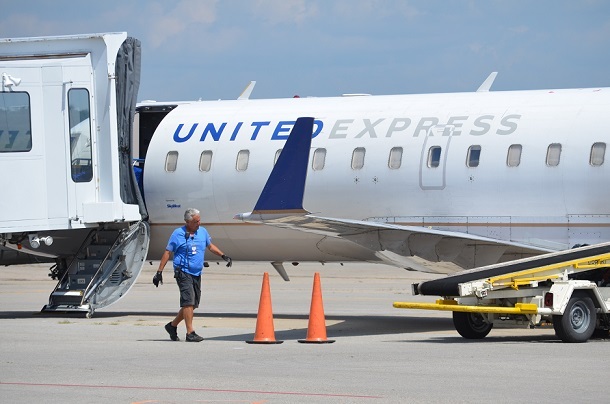 Relying on destination service from Allegiant to Orlando and to Myrtle Beach several months of the year that is usually at or near capacity and a suddenly reliable daily flight service from United Express, Rock believes the airport is past recovery. He believes it’s in regular growth mode. Again, the numbers back that. Last year the airport had the most passengers flying out of Bridgeport in decades with 25,835 passengers. With August’s numbers not yet added and four more months remaining the airport has had 21,290 passengers through July in 2018. Although the Myrtle Beach service is soon to end until 2019 and the Orlando service will take its annual hiatus, charter season is about to begin in full swing. Most of the flights involve West Virginia University athletic programs as well as other athletic teams in the Big 12 Conference. Editor's Note: Top photo shows a United flight getting ready for takeoff last week in Bridgeport. Bottom photo shows Airport Director Rick Rock talking to the Airport Authority on passenger numbers.